Although it includes some discussion of chemically complex reactions and the chemographic relationships among amphiboles and other rockforming minerals, most of Volume 9A of Reviews in Mineralogy treats amphiboles and other hydrous pyriboles as isolated systems. In contrast, Volume 9B is dedicated more to an exploration of the social life of amphiboles and the amphibole personality in real rocks and in the experimental petrology laboratory. The chemical complexity of amphibole, which Robinson et al., refer to as "a mineralogical shark in a sea of unsuspecting elements," permits amphiboles to occur in a very wide variety of rock types, under a large range of pressure and temperature conditions, and in association with an impressive number of other minerals. The description of amphibole petrology and of petrologists' attempts to understand amphibole phase relations are therefore not simple matters, as the length of this volume suggests. Although they do not cover every type of amphibole occurrence, it is hoped that the papers in this volume will provide the amphibole student and researcher with an up-to-date summary of the most important aspects of amphibole petrology. 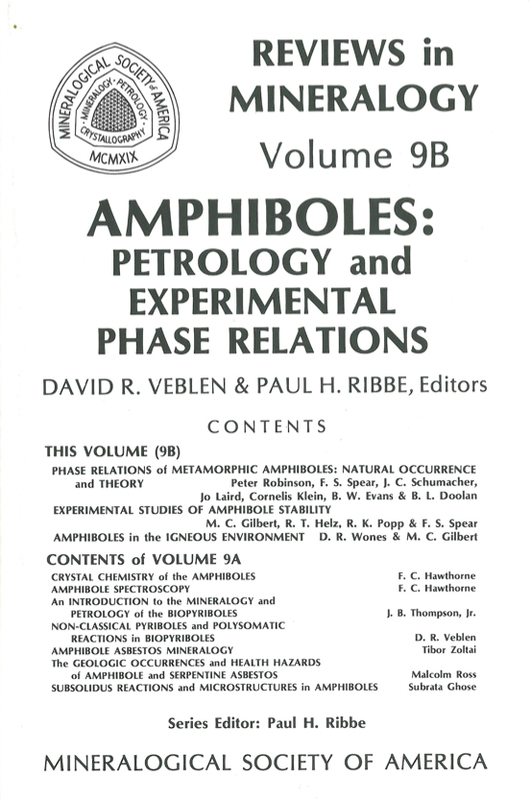 Volume 9B, Amphiboles: Petrology and Experimental Phase Relations, was begun in 1981 in preparation for the Short Course on Amphiboles and Other Hydrous Pyriboles presented at Erlanger, Kentucky, October 29 - November 1, 1981, prior to the annual meetings of the Geological Society of America and associated societies. Unfortunately, only the first chapter was in manuscript form at the time of the short course, and publication was delayed by one year.